Fast Cory: The Happiness Contest! A year ago I checked out the book from the library. I returned it after two days and ordered it from Amazon because I quickly realized that this is a book that I would need to underline and write in my own notes. 1) Act the way you want to feel. 2) Do what ought to be done. 3) Be present in the moment. 4) Be kinder than necessary. 5) There is only love. 7) Say “yes” to life. 4) Add a comment about something that makes you happy: 1 Entry per comment - the more the merrier! Winner will be drawn at random in one week on August 10th. Good luck! Um awesome giveaway! I am follower of course. I liked the author/book on fb! Your blog makes me happy! :) Oh and a ginormous mexican meal after a race. And I liked Gretchen Ruben on Facebook. What makes me happy? Sharing dessert with the hubby! Riding my bike makes me happy. Getting to share my nephew's first run with him as he tries to start running made me REALLY happy. yayyyy!!! i am so excited for this giveaway. ever since you mentioned it in a comment last week I have had my eye on this book...I will probably get it even if I don't win but if i win...even better! FOLLOWER! liked the author on FB! posted your giveaway on my blog! I am a devoted follower. Is that gratifying or frightening? You choose. But it gets me three entries. I also mentioned you on facebook - another 3 entries. And...I like Gretchen on facebook. A giveaway trifecta. Follower! Thanks so much for turning me on to this! Sounds awesome. I was just thinking about why marathons make me happy today. In the late miles when the going gets really tough, through the pain I feel so much gratitude toward the other runners, spectators, support crew, everyone who made that day possible and that keeps me going to finish. seeing how happy my puppies are when i come home makes me happy!! hearing james tell me "thank you for the yummy dinner, mom" makes me happy. watching eliza take 4th at the championship swim meet (who cares that there were only 4 swimmers in her age-group) while improving her time by over 40% makes me happy. Never thought I would like to admit that I am a follower! Liked her facebook page and shared on my FB wall too. - raindrops on roses and whiskers on kittens... no wait... I saw that in a play. - seeing other people joyful makes me joyful. pictures of jumping during a tough race makes me smile. - having the bills paid early. Hugs from my 4 year old when he wraps himself around me. Sounds like a great book! I am a follower! I will post the giveaway on my blog in the manana! Way too tired for my slow computer right now! My heel somewhat cooperating makes me HAPPY! I liked Gretchen on FB! I added your giveaway to my sidebar! 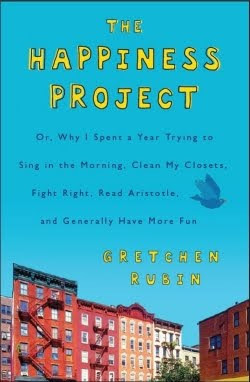 "Liked" The Happiness Project on FB! I'm a follower!! Of course! What makes me happ is meeting other people who say "yes" to life! Living in the moment and not sweating the small stuff. Something that makes me happy? Waking up to my dogs smiling face and kisses. Yes, dogs can smile! Kayaking also makes me happy. What a great giveaway!! I'm a follower! Posted your giveaway on my blog sidebar! Date Night with the hubby makes me happy! Watching my children laugh and goof off together makes me happy! You know I'm a stalker. Running makes me happy. Most days anyway. New books make me happy. Kindle versions are even better. And FREE Kindle versions are even better than that! Sleeping in and going to bed early. Did I already mention my kids? Because my kids are awesome. Reading funny blogs makes me happy. Spending some time with my 4.5-YO twins at the pool today made me happy! I think it's going to make me happy tomorrow too. My tempo run this morning made me happy. A great run always does. My husband Dan makes me happy. I'm so grateful that we found each other. I posted this contest on FB! I like Gretchin Rubin on FB. I like the author on facebook! Making new friends and spending time with old ones makes me happy! Cory, I am a follower of your blog. I will link this contest on my facebook. I am already a follower. I mentioned this contest on facebook and liked Gretchen's facebook page. Things that make me happy, are being with my kids, riding my bike or trike, and eating cheesecake. One more thing that makes me happy...breathless anticipation on giveaway day! I posted this giveaway on my blog!! Sounds like an awesome book! one thing that makes me happy is hear my kids laugh.